Take your backyard entertaining to another level with this brand new fire pit exclusively available online as well as any Family Leisure store. 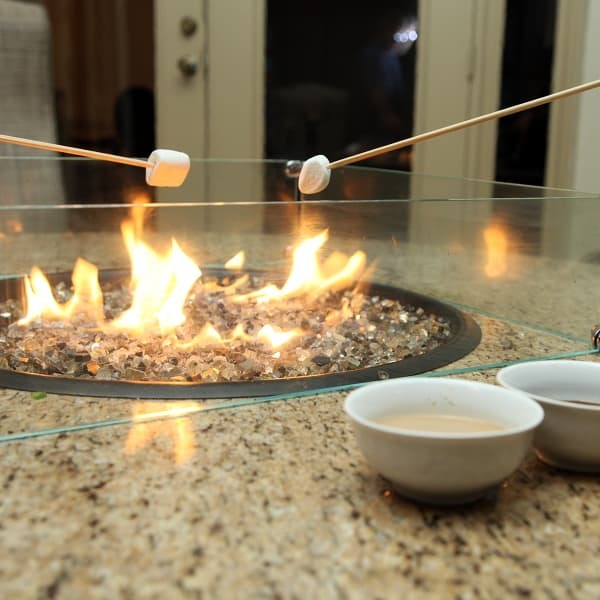 The Firetainment fire pit is not only a natural gas or propane based fire pit , but its also can be a dining table as well as a cooking table! 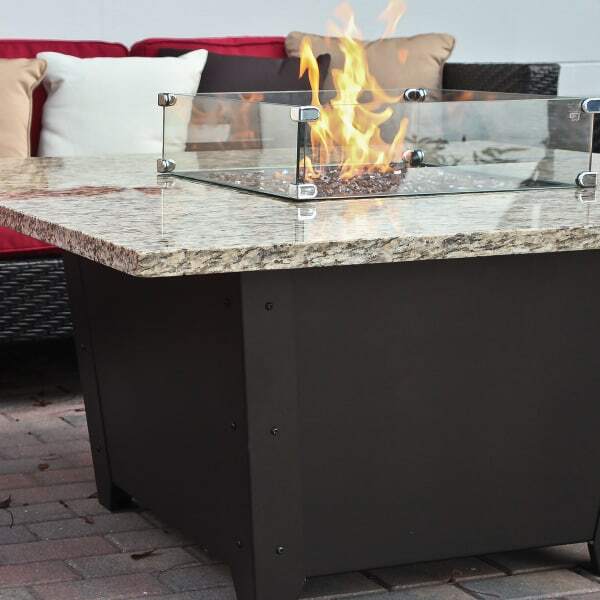 Depending upon how you entertain outdoors you can also elect to option your fire pit with a matching granite lazy Susan so that your fire pit can transform into a beautiful outdoor granite table. 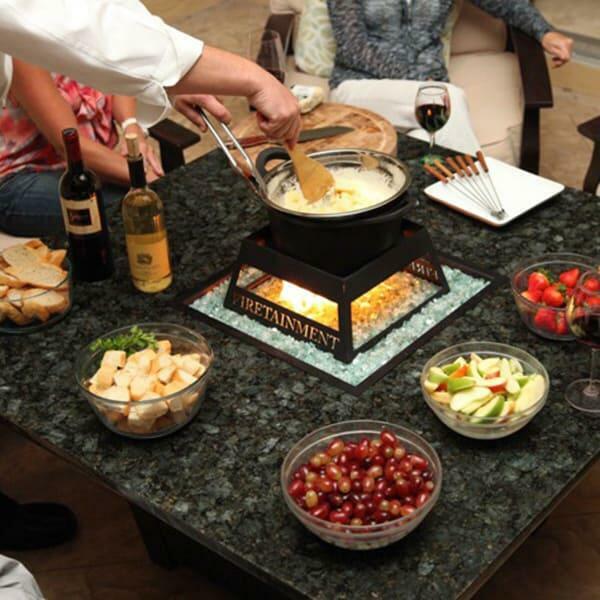 This patent pending fire pit cooking system is truly unique to the industry but allows for backyards that have a tight footprint the versatility that no other fire pit on the market can offer! 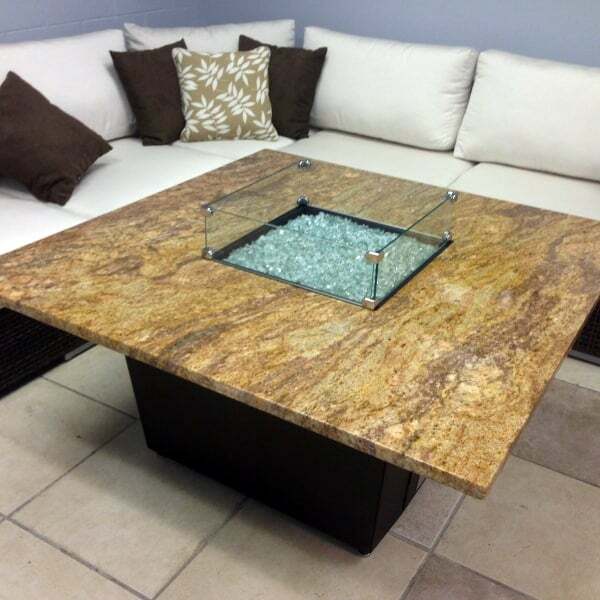 Six different colors of granite are available, as well as a wide variety of fireglass to choose from. 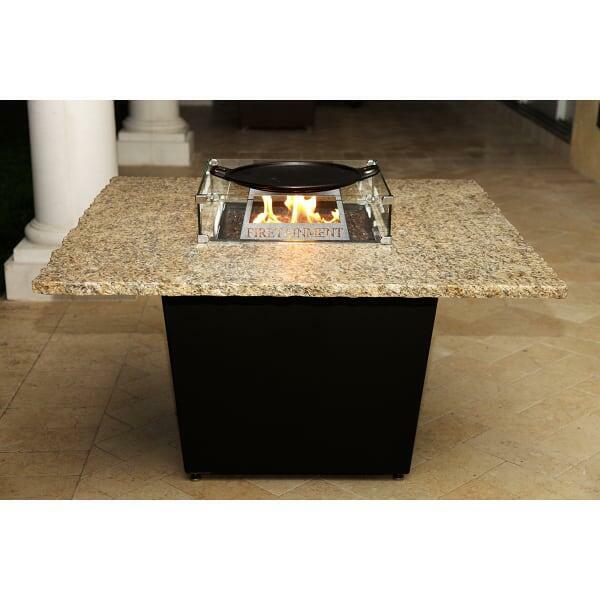 You can truly make this next generation fire pit your own personal outdoor entertaining companion! 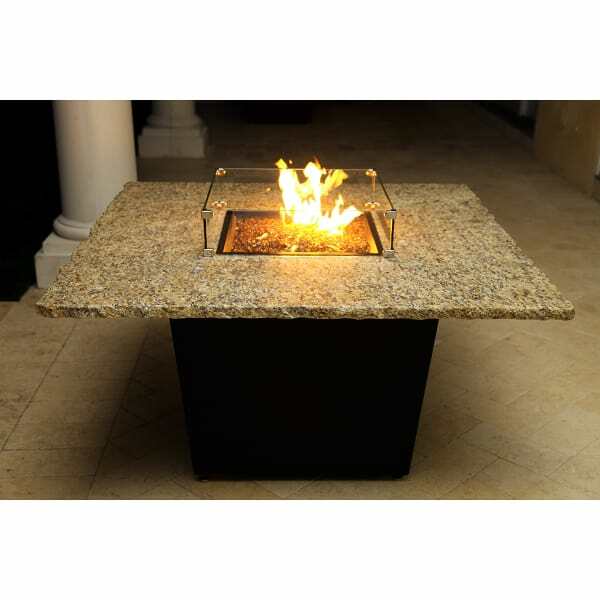 Named after the city that plays host to the works of such great Spanish artists as Picasso, Goya, Dali and Miro, the Madrid 48” Square Fire Table by Firetainment can hold its own. 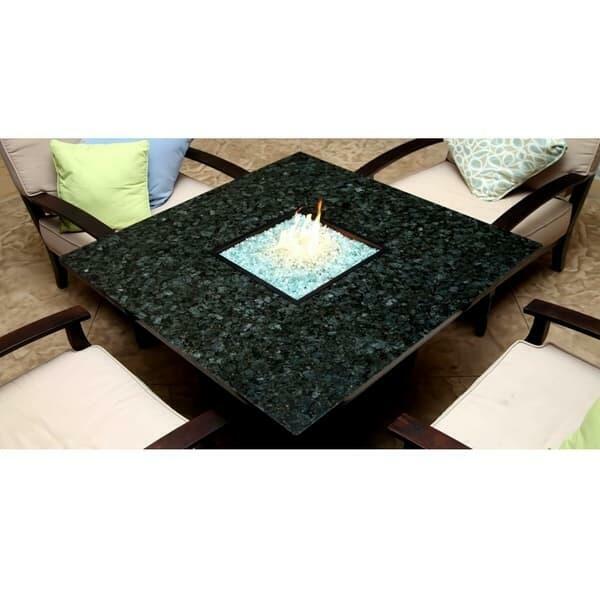 The 48” table top is crafted in solid granite, available in your choice of six lustrous colors. The Madrid offers room for 4-8 people to gather comfortably. The dining version has 24” of leg room for your guests to enjoy some spicy paella or grilled chorizo. The chat version is 21” high, making it the perfect place to enjoy an assortment of tapas and each other’s company. 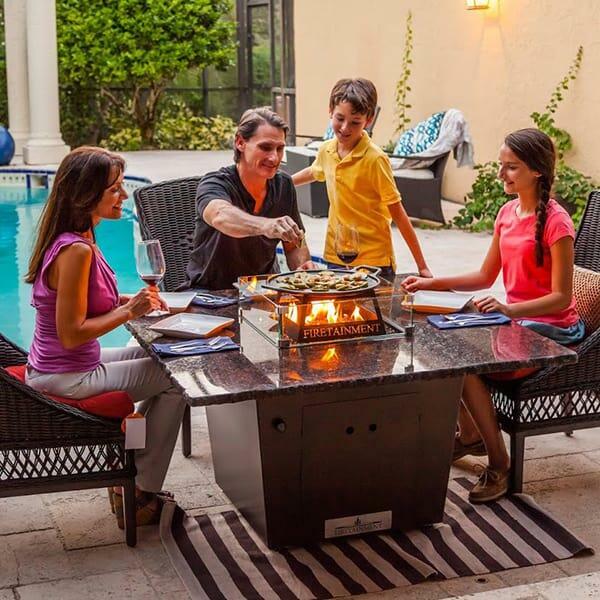 The Madrid 48” Square Fire Table comes with a 40,000 BTU Stainless Steel Burner and a Stainless Steel Braided Propane Connection Kit and is suitable for either natural or propane gas hook-ups. This item requires freight delivery and the shipping method uses a full-size semi truck. This product will be delivered to a street side location and will be placed in any reasonable area accessible by wheels. A representative will call to schedule the delivery which will require a signature upon receipt. These items will drop-ship directly from the manufacturer within three business days of order placement. Some orders can be delayed by the manufacturer five to six weeks for delivery; in such a case, Family Leisure will notify the customer as soon as possible. Shipping is free nationwide, within the Continental U.S.A. The customer is responsible for placement and assembly of this product beyond the threshold delivery. Feel free to contact us with any questions.